OK I am officially caught up except for one more post! I will post on Uncle Carey and Aunt Alana's wedding pictures probably after our mini vacation to Colorado which we leave on in the morning! YIPPEE!! 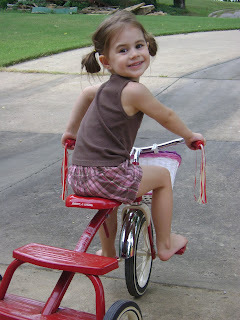 Now off to do laundry, pack, run errands, clean house, etc., etc., etc.!!!!!! Nona and Pop went to visit Aunt Staci in Virginia and they took a 4 hour bus ride to New York! 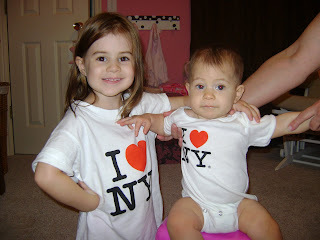 (Yes I was very jealous :) They did bring us back some Tshirts, though and here are the girls sporting their I heart NY shirts. So cute! 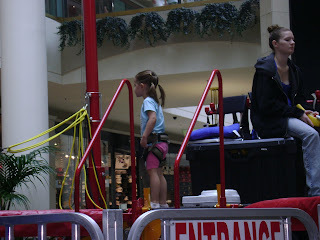 There is this bungee jumping thing over a trampoline that is set up in our mall and Avery and I saw it a couple weeks ago. She really, really wanted to do it so we took her back (with the camera) so she could jump. She barely made it over the minimum weight limit! 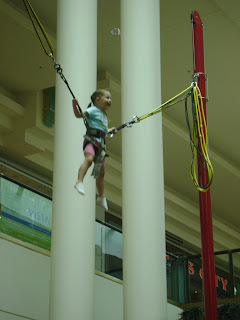 The guy pulled on the bungee cords towards the end and she went SUPER high! 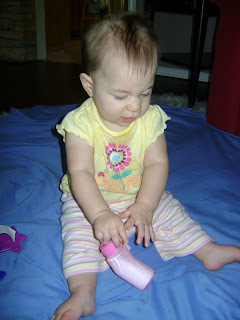 She was squealing and laughing. 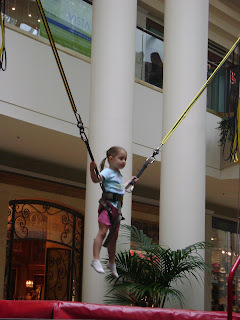 This girl is not afraid of heights or anything scary! 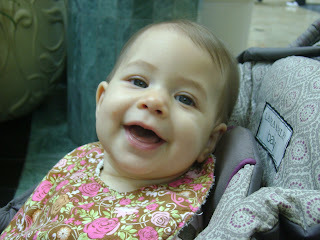 Sweet smiles from Bailey even though there was no jumping for little sister. :) We videoed with our regular video camera, so sorry there is no video on here. It was exciting, though! OK, you know, some weeks are long. Some weeks are boring. Some weeks we have to come up with some really crazy things to keep ourselves entertained! 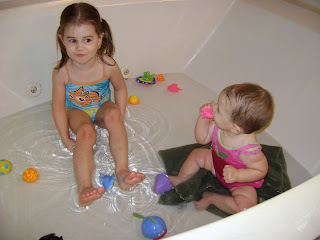 So one day last week I asked Avery if she wanted to swim in my bathtub (it's really big) with her swimsuit on! She was really excited and said yes! So Bailey joined in and they swam in like 2 inches of water. 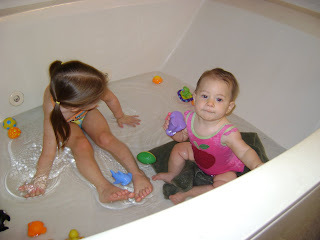 :) Bailey just started sitting up in the bathtub on a towel and I didn't want her to fall over and get under water, so it was not much water at all. It was really funny and silly but they had so much fun and that's all that matters! look at those hiney rolls! 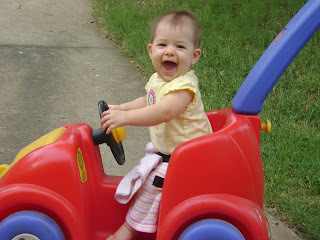 I really did not think that Bailey could sit up in this car, but the other day I thought I would try, and she did it! 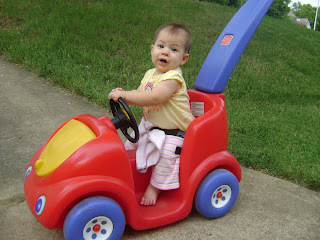 She loves to hold onto the steering wheel and to be pushed around. 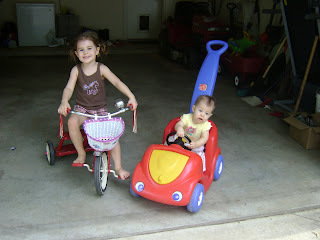 She and Avery had a blast playing outside together--I can't wait until Bailey can run around with Avery! This first picture reminds me of so many my mom has of my sisters and I standing outside barefoot and dirty after a hard day of playing! I totally love this picture. It's so sweet and honestly sometimes the rare extremely happy time for Bailey! 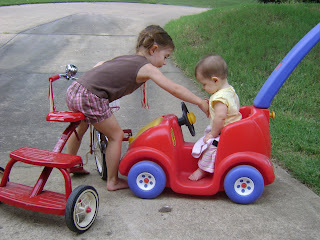 teaching little sister how to honk the horn! 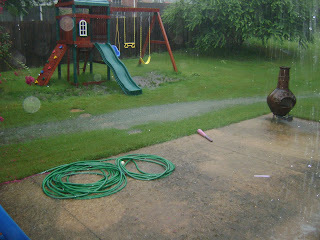 It poured that day and our backyard had a river running through it! My birthday this year was really great. Craig surprised me and took the day off! After he helped me make breakfast for all of us, I got to go back to bed for a little while after Bailey went down for her first nap! It was raining which was the BEST sleeping weather!!! Seriously, I never get to do this! 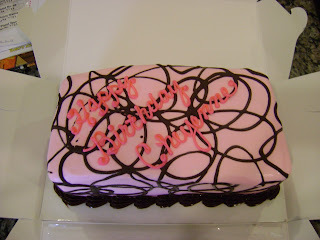 We played with the girls together that day and before lunch, Craig and Avery went to pick up an ice cream cake for me! My favorite! Later that night, Craig's mom came over to babysit while we went to dinner and then to see Wicked! It was so good and I love going to the PAC downtown. If you haven't seen Wicked and get a chance, you have to see it! It was a great day and I've got to say that 28 feels just like 27...I probably won't be saying the same when 30 gets here, though! 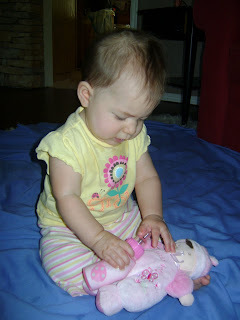 These pictures are when Bailey first started sitting up (a month ago). 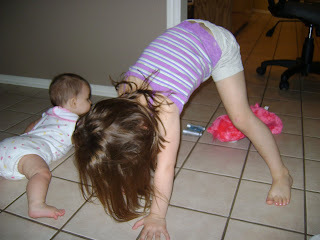 She was so funny with her legs spread apart and trying to balance. I love the way her nose is scrunched up in the other two pictures and it looks like she is trying to feed her baby a bottle but actually she was chewing on it herself. 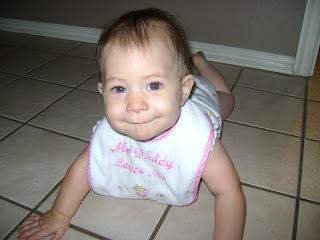 :) She is sitting up so well now that I can just plop her down and know that she won't tip over. 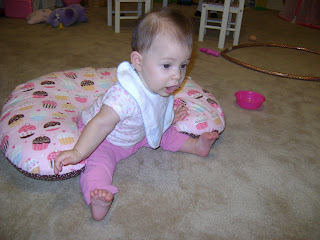 She can even get from her tummy to a sitting position all on her own! She is a VERY active girl! These two videos are of a very funny laugh/scream type noise that Bailey was doing a little while back. It has now changed into a high pitched squealy scream which is really fun for her to do when we're all sitting down in a restaurant. 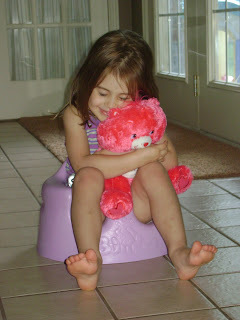 :) I seem to remember Avery going through this phase and I think we ate at home a lot then. Ha ha! These pictures are a little blurry. 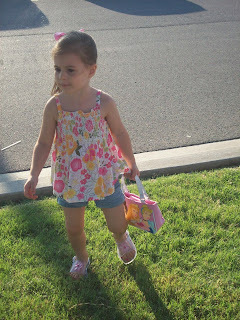 A while back when Pop and Nona were here, we went out to Tin Star (I know, so fancy :) Avery was so cute with her purse and everything I had to take her picture. 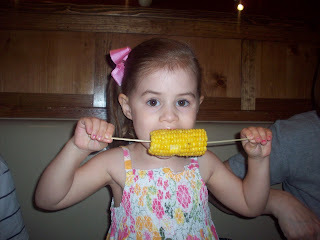 I love how she has to ask for another stick for her corn because she can't eat it with just one, so they're super long. 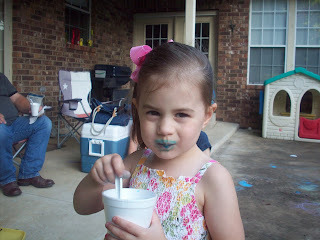 Then for dessert, she had a snowcone and got some beautiful blue lips! !